“Living Tree Alliance programs inspire, excite, and teach me about “earth-based Judaism,” offering new practices and traditions for myself and my family. The first holiday I celebrated with Living Tree Alliance was Sukkot on the Farm, Spring 2015. I entered the largest and most beautiful sukkah that I had ever seen. The day was filled with a variety of classes, music, prayer, and experiential workshops. The classes filled my mind with new thoughts and possibilities. The day created a new sense of community for me and many others, persisting now these three years later. People are willing to drive over an hour to experience Living Tree Alliance events. The first year, over 150 people attended Sukkot on the Farm. The second year, my husband and young son attended. This year, on Living Tree’s own land, over a dozen families attended. The drumming, inspirational and thought-provoking signage, bonfire, potluck, schmoozing, and a place for my son to play within a Jewish program/holiday celebration opened a new place in my mind and spirit, like nothing that I had ever experienced while growing up as a Reform Jew in the suburbs of Chicago. 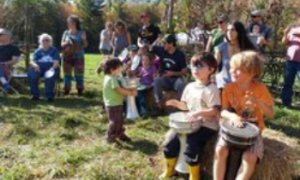 “Living Tree Alliance is home grown and perfect for Vermont and upper New England. The events give participants of all ages and denominations opportunities to participate in a meaningful way. Living Tree Alliance events appeal to a wide range of participants (e.g., youth, adolescents, adults, singles, families, observant Jews, cultural Jews, and non-Jews).